Whenever I painted this painting, I was thinking about the special relationship people share with our Savior. Like delicate lambs exploring the grassy fields of the Earth, humans face many uncertainties, challenges, and temptations in life. Like the little lambs, we sometimes can be led astray by these things, and no one else can lead us back on the right path beside our Savior, who keeps us in His loving and caring embrace. He is our shepherd, and if we listen to his callings and come to Him, he will keep us forever safe and loved. In this painting, I imagined the tender moment shared between the Good Shepherd and a lamb who lost his way. 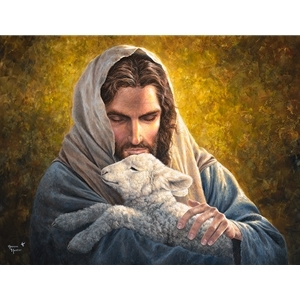 It makes me warm and fuzzy inside to think of Christ holding me close just like this little lamb!